About Us - Z Systems, Inc.
Margie is the glue and the driving force that keeps everything running at Z Systems. While the rest of the crew is out proposing and implementing all these great solutions for our customers, Margie is keeping everything organized. She also does all the accounting, taxes, payroll, and HR. If you have any questions about billing, she is the go-to source. Her many skills include making a killer pot roast and lots of very funny faces – both to the delight of her family. 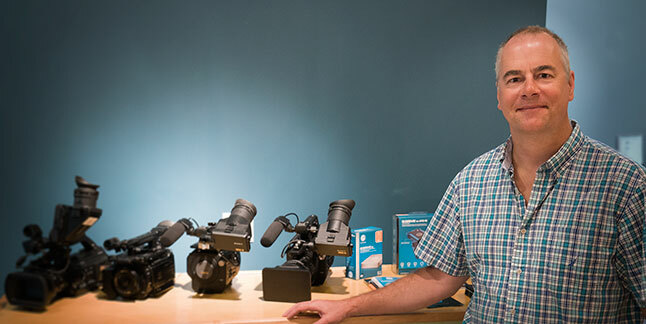 John received his degree in electrical engineering, and promptly went into the audiovisual industry right out of college. Job roles have included consultant, design engineer, sales engineer, and now sales manager of Z Systems. John founded Z Systems in 1998 based on a need in the marketplace for a small, elite group of highly technical people to tackle the tough jobs in a very hands-on manner. Freddie came to Z Systems in 2015 as our director of digital marketing. He brings with him a lifetime of experience in the world of multimedia production and design, having worked as a freelance audio and video producer, as well as a graphic, web and print designer. When Z Systems needed to fill an account manager position in June 2017, he was the perfect fit to hit the ground running, already being familiar with Z Systems’ mission, culture, products and customers. Freddie is also a musician, playing in the band The Jones Dickens. You can hear his music online and at venues around the Twin Cities. Keith graduated from Metropolitan State University in 2010 with a B.A. in Screenwriting. He has been involved with over twenty short film productions in the last six years and has worn just about every hat there is in film production. His work been selected to screen at film festivals all over the country and has won awards for directing, editing, cinematography and lighting. He is always eager to get his hands dirty learning a new technique or piece of equipment. Keith was happy to accept the opportunity to work at Z Systems based on his experiences competing in the Z-Fest Film Festival several years in a row. He clearly saw how committed Z Systems is to showcasing the talent in the community and is proud to now be a part of that by providing the tools filmmakers need. Jay has been with Z Systems since 2000 and has been an Apple-Certified MacOS and Xsan Technician since 2005. He’s run the integration department since 2007. His primary duties are facility design & engineering, estimating jobs, and managing projects. Jay holds a Bachelor’s Degree with Honors in Broadcasting and Film Production from the University of Iowa. Before Z Systems, he spent twelve years ‘in the chair’ as a professional film and video editor. Jay also researches and writes in the field of space history. His book Ambassadors from Earth was published in 2009 and won the Eugene M. Emme Award for astronautical literature. His most recent book, Infinity Beckoned, came out in late 2015. Before (and while transitioning to) the boreal world of film and television, Jay competed for ten years as a sponsored endurance athlete. He recorded one triathlon win, numerous top-ten placings, and finished the Ironman Triathlon. He has qualified for the Boston Marathon. In 2016 he placed fourth overall at the Swim4Freedom, an eight-mile open-water swimming race in Wisconsin. Jeremy has a background in audio as a musician and engineer as well as in the construction industry. He worked at a studio as a sound editor for a TV show for two years. After working in construction for 20 years, he went back to school for networking and has become Microsoft, Cisco, and Mac-Certified, as well as Pro Tools-Certified for Post and Music in 2008. Jeremy also is a drummer (don’t hold it against him) and is involved in several projects ranging from jazz, rock, alt-country, noise and occasionally a Gordon Lightfoot Tribute band. He currently is in a jazz group called The Willie August Project and an indie alt-country band named Buckrodney. We met Conrad when he almost won Z-Fest VI with his short Western film Three Card Draw. He was a little miffed that he didn’t even get considered for ‘Best Visual Effects’ – the mountains in his film (shot in rural Minnesota) were so real, no one ever thought about them as an effect. Although he wasn’t considered for that award, his film did get 15 nominations and took home five awards.Conrad lives and works at Truhaven Ranch, a rescue ranch for horses. He’s also a photographer, visual effects artist, graphic designer, filmmaker, carpenter, and amateur astronomer.At work, Conrad is our Adobe specialist, as well as a great Apple and Windows technician.